CardiacTrainers are designed to teach surgical residents and medical students proper suturing technique. Students submit practice videos to an online learning management system where they can watch and learn techniques from world-class surgeons. Cocreate connects a community of makers, artists and engineers who believe in collaborative creativity and the sharing economy. The purpose of CoCreate is to empower all people by creating a supportive and collaborative community, with the ultimate goal of harnessing regional and global capabilities to maximize value creation and potentiation for all. The CoCreate Community’s mission is to maximize the potentiation of individuals and organizations by creating a readily traversable and global network of creativity and entrepreneurship. The CoCreate Community’s vision is of a world in which each person, as an individual or as part of an organization, is able to maximize and express his or her sense of possibility for a rewarding and successful life. Empowered by the camaraderie and enabling resources of the environment and the community, CoCreators maximize their potentiation by habitually learning, sharing, imagining, and creating. Alex's work with brain-controlled helicopter flight has gained national attention. In a recent interview with Puzzlebox, Alex explains his research. Alex's research has also shown that "Virtual Reality Hands" may help stroke survivors recover hand function. Devil's Advocate is a destination bar in downtown Minneapolis serving meatballs and craft beer. We designed a menu and brand that would suit the mystery-loving conspiracy-theorist in all of us. The Choosatron is a mini-arcade kit by Jerry Belich that plays choice based stories. Synaptic Design designed the identity behind the local start-up project. 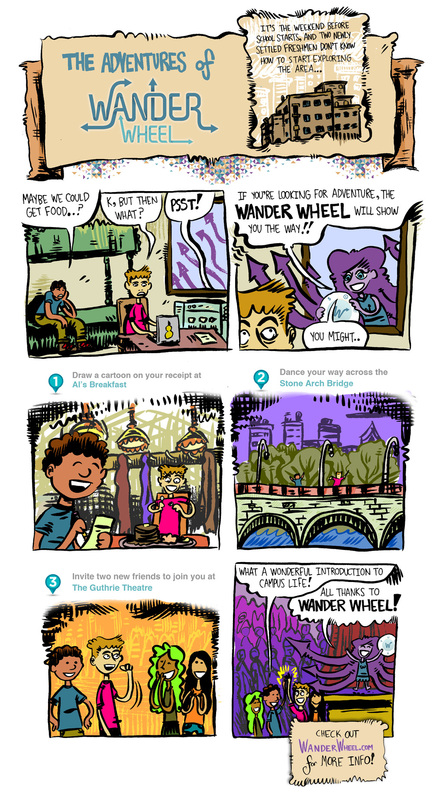 Wander Wheel is an interactive adventure-finding application that uses your location to create a whimsical goal-based itinerary. No matter where you are, the moment you open Wander, you'll be given an adventure with special missions for each location on your list. From high-fiveing trees to photo scavenger hunts, you'll never run out of fun things to do. Medjules are low-cost surgical skills trainers that provide objective feedback.The universal base allows each modular top to send skill-specific data to the cloud. Medjules are being tested within different departments at the University of Minnesota. Learn both the basics and intricacies of skin closure. Using an outcomes-based assessment system, data on wound approximation and eversion are available for review after working with this trainer. This classic operation game tests the dexterity with which a surgeon can operate laparoscopic instruments. Data on speed and accuracy of tool handling are reported for a user’s view. No surgical training is complete without a fluent command of secure surgical knots. This trainer assesses with a standardized force the speed strength and integrity of each knot that a surgeon makes. PARENTAL ADVISORY: CONTAINS EXCESSIVE SEXUAL DOUBLE ENTENDRE. Not for the faint of heart! This hard-hitting whimsical fairy tale is sure to get the conversations started. Be sure you are "Keeping up with the Johnson's" with this lovable tale of body differences, good decision making, and consensual relationships. Preorder your copy now to ensure delivery slated for late summer 2014. 28 beautiful full color illustrations by Synaptic graphic artist Uncle Louis with accompanied rhyming poetry written by Synaptic founder Alexander Doud are almost sure to delight (unless you aren't down for that kind of stuff). Take home a copy of the newest book that "cannot be printed in Minnesota on primarily moral grounds." However, if whimsical ele-phallic representations of the more intimate corners of the human body are not your cup of tea, it may be best to sit this one out.